SCVHistory.com DI6701 | Roads | Construction of Interstate 5, Grapevine Area, March 1967. 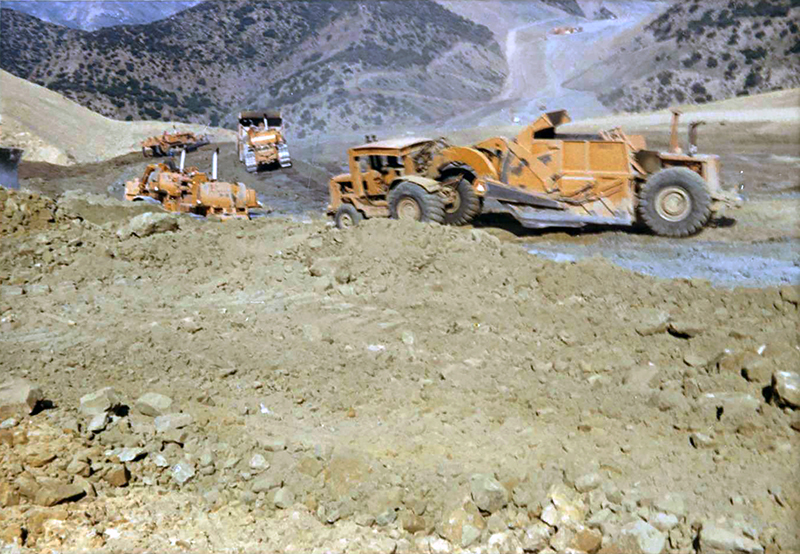 Heavy equipment operator Bert W. Tolbert moved with his family to the Hasley Canyon area of Castaic in 1965 to take a job with Western Construction, which was building Interstate 5 in the Grapevine area. 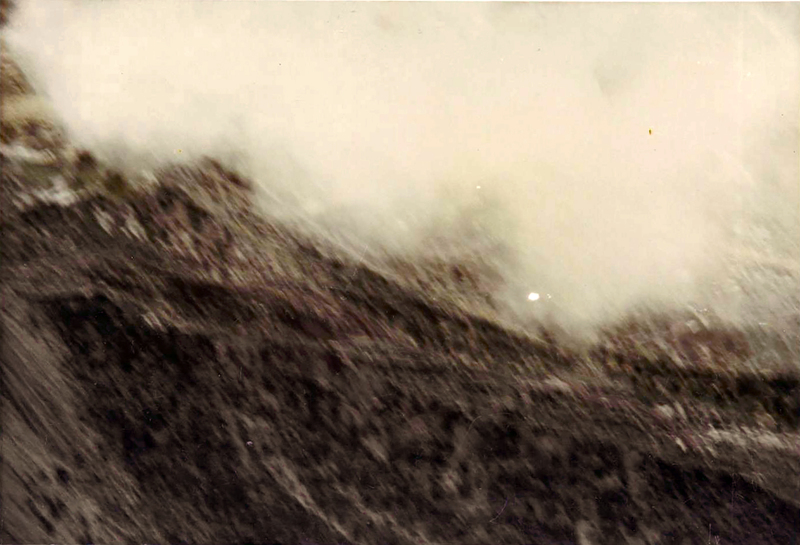 These are his photos of that work; the first (above) is dated March 1967. The work was completed later that year. His daughter, contributor Sharon (Tolbert) Divis, writes: "When he finished working on the Grapevine, he switched over to Castaic Dam. ... He ran heavy construction equipment until becoming an instructor for Union Local 12 in 1976, eventually becoming Apprentice Training director of the Operating Engineers Training Trust, which is in charge of the apprentices for Local 12. He retired in 2013." For Santa Clarita Valley residents, construction of the interstate freeway from the Mexican border to Canada was really one more in a long line of highway improvements stretching back 50 years to the opening of the Ridge Route across the mountaintops to the floor of the San Joaquin Valley and beyond to Bakersfield. The original route was followed by the new and improved "Ridge alternate," which gave way in 1933 to the even newer — and straighter — U.S. Highway 99. Interstate 5 was born on paper in 1956 through the Eisenhower-era National Interstate and Defense Highway Act, which diverted money from the defense budget to link strategic military facilities via a modern highway system that civilians would also be able to use. It was late in John F. Kennedy's presidency before there was tangible evidence of it locally. Just as the new State Route 14 was starting to open section-by-section on the east side of the valley in 1963, the first eight-lane section of Interstate 5 was underway on the west side between Lyons Avenue and about one mile north of Castaic Junction (Highway 126). The Newhall Land and Farming Co., with its new town of Valencia on the drawing board, successfully lobbied for additional on- and off-ramps where originally only one was planned. By that time, actually in July 1964, the California Highway Commission came up with a bizarre idea to save money on engineering that was otherwise needed to make the steep climb north of Parker Road manageable for trucks. The existing Highway 99, which was decommissioned locally that same year, would become the northbound I-5 freeway lanes, while southbound lanes would be separated off to the east. That meant the north- and southbound lanes would switch sides, with an upper and lower crossover to put them back where they belong. At that same 1964 Highway Commission meeting, the decision was made to separate cars and trucks in the Newhall Pass with their own dedicated lanes. Construction of the new Interstate 5 Freeway through the Santa Clarita Valley was completed in 1967, coinciding with the opening of the first Valencia homes. Construction over the Grapevine and into the San Joaquin Valley, with separate alignments for each direction of traffic — but without switching sides — was done by 1970. 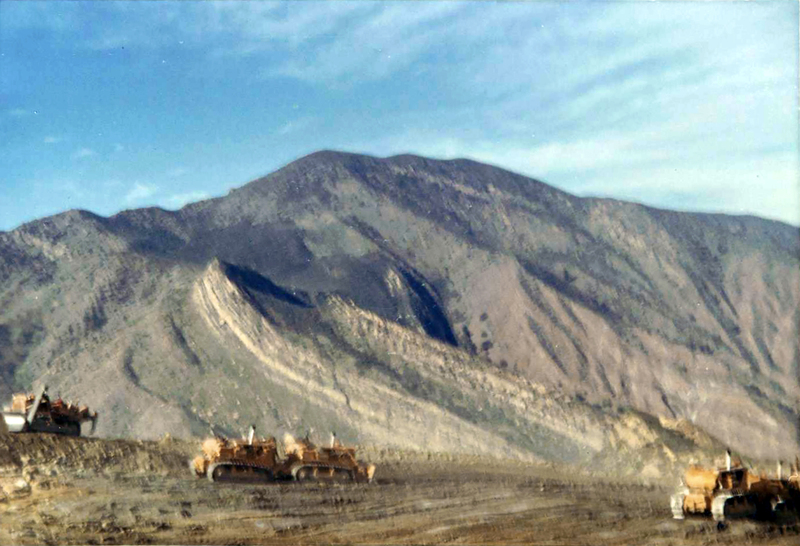 The final section in California, near Stockton, opened in 1979. DI6701: 9600 dpi jpegs courtesy of Sharon Divis. Online only.